Heading out of Manasquan inlet the air was a little crisp, with clear skies and the slightest hint of wind. With mirror flat seas, it was another day on lake Atlantic. There was a clear consensus among the divers: This sure beats work! 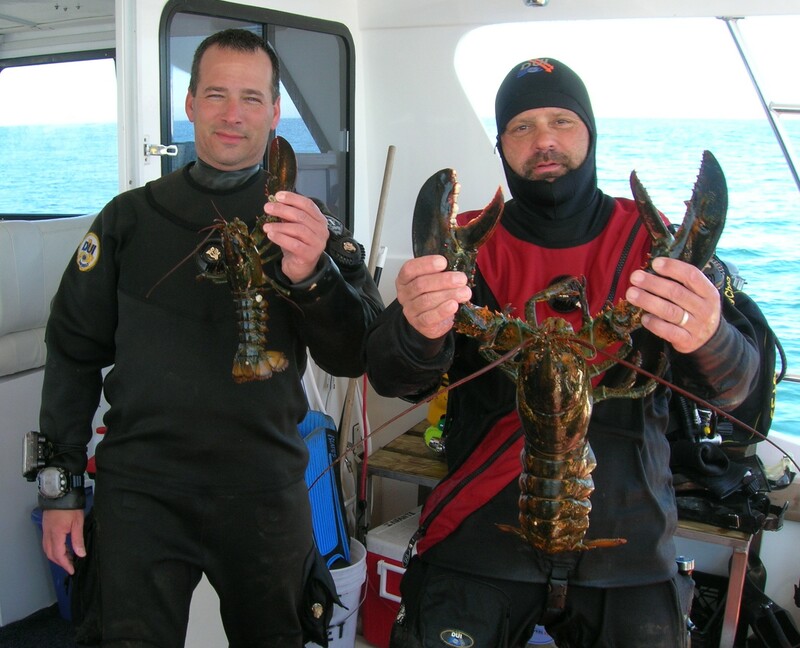 Some of the divers had 32% mix so we stayed inshore and hit the Pinta. The Pinta was a freighter carrying a cargo of hardwood. She collided and sank in 1963. We arrived on site quickly, and the crew expeditiously tied in. Obviously every one was excited to dive as they hit the water as soon as the pool was open. The clear surface water of last week, has been replaced with a tea brown soup. However, this was only on the top 20 ft. Once below this layer the vis opened up to a dark 20 ft. Once we switched on our lights, it was actually quite nice (in a Jerseyesque way). There was little to no current on the wreck and the bottom temp was up to a toasty 43 Deg. The wreck’s structure has opened up since my last visit. We spent our time checking out the inside, poking in every crevice we could find. We scared a few fish off in the process. A few large tog were about, with an occasional seabass. Lobsters, on the other hand, were few and far between. On the way back to the anchor I noticed a large brass valve above the diesel engine. I’ll bring tools on the next dive. Our hour was up, and we ascended the line. The safety stop was a warm 58 degrees, but we were in the tea water. You could barely see your gauges. The surface interval was spent talking about the dive, the areas everyone had checked out, and how much the wreck has deteriorated. Before long everyone was ready for round two. This time I jumped in with a few tools in tow. I passed Capt Mark on the way down the line. He was signaling something that I could not quite make out. I was pretty sure it involved a crowbar (one tool I did not have). I signaled OK, and continued my decent. After a false start locating the engine, I arrived there just in time to see Mark approaching, crowbar in hand. I guess we are committed now. The two of us proceeded to work on the steel bolts that were now weakened by rust and time. Video of the event might have been humorous: watching divers try to stand on a crowbar at depth. Between all the prying and pounding, the valve finally came free, and I nearly drained my bailout filling the lift bag to coax it off the bottom. On the way up we did an extra long hang to compensate for the work at depth. The NOAA forecast was for 5-10 knot winds, and 6-8 seas. Something is wrong there. Obviously there was something stirring off shore. (We now know it as Andrea.) When we got to the boat, there was no wind, and the bay was mirror flat. The captain wanted to take a look and see what Mother nature had in store for us. Good Call. Swells were causing huge waves just at the end of the inlet, and it was slow going out. Once clear, there was just a 3-4 swell. Captain Dan made a run for it. It was a 60 mile trip to the Oregon. After tying down all the gear, we hit the racks for the long trip. As we neared the wreck, the swells seemed to settle down a bit, and the surface water was very clear. There was now a slight breeze, but nothing to speak of. Richie gave us all a briefing on the layout of the wreck. Complete with digging recommendations. As this was my first time on the Oregon, I was more interested in a quick tour. With a water temp of 42 and a depth of 130, this was not going to be a long dive. Divers geared up and rolled in. By the time the last on hit the water, our crew was back up with a condition report. No current on the bottom, a slight surge, and 20 ft of vis. Richie held up his bag with a few scallops, one 2 lb lobster, and one in the 8 lb range. Nice catch. When I hit the bottom, I could see a strobe off in the distance. Shortly, John went by with something on a lift bag. I started looking around, but my tour of the wreck was cut short by images of large lobster in my bag (Damn Richie). While there was enough light to sea clearly, I turned on my light and wend searching in each hole. I covered a lot of wreck, but was not having much luck until I noticed a solitary scallop. Hummmm. Off I go into the sand! One more. Maybe two. Where are they? After a hundred feet, I gave up, and headed back at an angle. I ran into a few piles of debris out there, and checked them out. Just before reaching the wreck there was a hull plate with tell tale antenna. After putting him in my bag, I continued back. My hands were getting cold now and it was time to head for the line. Three scallops, and a lobster. Not great, not bad. As I hit the wreck, I hit pay dirt. A group of scallops laying in a washout. OKay, don’t crush the lobster. Something is wrong here. I go out into the sand and get lobster, I come back to the wreck and get scallops. That’s just not right! By now my hands were really cold. I headed for the line, untied my reel, and headed up. The water temp reached 48 at the 20 ft hang, and it felt warm by comparison. Dry gloves, got to get out the dry gloves! The rest of the divers opted for one long dive rather than two short ones, we pulled anchor and headed in. John’s find turned out to be bottles. I hope he shares some pictures once they are cleaned up. We had following seas on the ride back. Another great day to dive!